Public domain school images from vintage children’s books and other printed materials. The images we’ve found and added to the school images section of Reusable Art represent some of the most iconic images we remember from school. We have book images, school drawings, drawings of children’s slates and a variety of other drawings that can be used by scrapbookers and others to create projects for back to school and school memories. The School Images category was only created in July of 2012. Almost since the beginning of Reusable Art, we have been building a nice group of drawings of children. 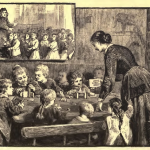 One of the sections of images of children includes a group of illustrations depicting children reading, learning or doing other academic type activities. You will find those drawings in our Science Images where you might find some great illustrations to use when talking about learning about science. I’m sure there’s a number of other image categories on Reusable Art that could be used with Back-to-School or other academic projects but I think those would be the ones you would most commonly need. Vintage drawing of a village school. Vintage drawing of three schoolbooks tied with a strap. Drawing of a vintage writing tablet or slate from school. 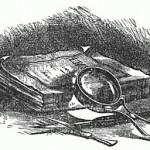 Advertising image for a vintage magnifying glass. 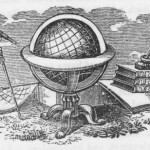 Drawing of abandoned learning tools of a globe, telescope, books, pen and ink.